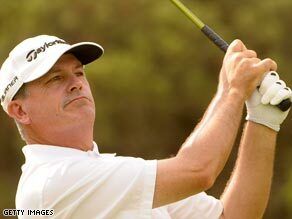 (CNN) -- Paul Goydos pulled ahead of overnight co-leader Justin Leonard to move into a three-stroke lead at the halfway point of the Valero Texas Open. Goydos posted six birdies to hold a three-stroke lead after 36 holes of the Texas Open. The American had begun the day tied on seven-under-par with former Open champion Leonard, a Texas native, who started early at the par-70, 6,896-yard Resort Course at La Cantera and followed his first-round 63 with a two-under 68 to move to nine-under. Goydos set off in pursuit later in the day and got off to a bad start with a bogey on his first hole at the par-four 10th. But it was to be the only blemish on his card as the 2008 Players Championship runner-up knocked off six birdies for a five-under 65 to get to 12- under-par. "Another good day," Goydos told reporters afterwards. "Really only had one mediocre shot all day, and that was on the first hole. I made bogey, and after that I played reasonably well." Mathias Gronberg led a Swedish charge in San Antonio, opening the day on four-under and going one better with a second-round 65 to take a share of the clubhouse lead with Leonard on nine-under. American Ted Purdy improved by three strokes with a 67 while his compatriots John Mallinger, with a 64, and Scott Sterling, who posted a 63, made it a five-way tie overnight for second place.